Here is my honest review on the next-gen installment of InFAMOUS: Second Son. 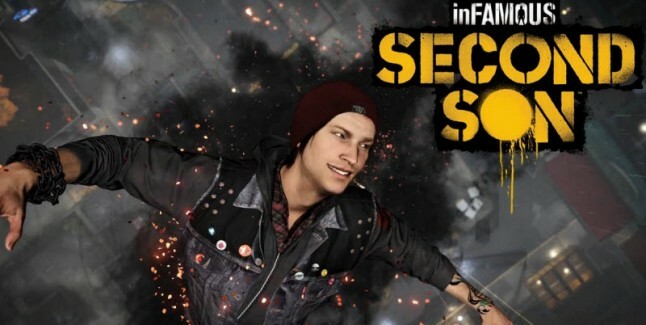 If you’re interested in watching my SPOILER-FREE video review of InFAMOUS Second Son, check it out! The next generation of gaming is here. And it pretty much arrived on the release day of Infamous Second Son for me because this was my first game I purchased for the PS4. Second Son was definitely one of many PS4 exclusives that made me decide that the PS4 was for me. I had never played an Infamous game in my life but everything I was seeing for Second Son just looked too cool to ignore. So, did it live up to my expectations and to it’s hype as a powerful next-gen game? Let’s check it out! Before we get to the juicy stuff, first, let me tell you a little bit about Delsin Rowe (Troy Baker), the protagonist. Delsin is a young man that belongs to a very familial Indian tribe. He likes to spend most of his time making “inspirational” graffiti art anywhere and everywhere he shouldn’t. And by the way, you also get to participate in this graffiti art with the PS4 controller by turning it on it’s side and holding it like a spray can. So cool 😀 Anyways, because of this, he is usually found running from the law with his awesome parkour skills. Even though his older brother, Reggie, sees him as a troublemaker, his heart is where it counts and he demonstrates that he’d do anything for his family and friends. Without going into too much detail, Delsin finds out that he is what is called a Conduit, or the more negative connotation, a Bioterrorist. Like previous Infamous games, Delsin manifests superhuman powers that can be used to become Famous or Infamous. Meaning, you are given many opportunities to use your powers for good, or for bad. The story wasn’t bad but it wasn’t extremely captivating in my opinion. In Second Son, you pretty much only have 1 plot specific goal. Everything you do throughout the game is for you to reach that goal. But after so long it starts feeling kind of like that goal is starting to become old news. At least that’s how I felt at points. This isn’t a bad technique but what really bummed me out was that there were some side plots that I was getting really into because they were character developing plots, and after a while, they’d just be abandoned…after quite a bit of detail AND meaning had been put into it. I may have found that a bit disappointing because I highly value character development and character relationships with other characters presented, but I honestly think if they had kept those side plots as supportive storylines to the main plot, it would have been so much more captivating…for me at least. The graphics were very nice. I think the next-gen graphic capabilities were best demonstrated by the facial details/expressions. The scenery was very pretty but it didn’t make me notice the true power of a next-gen console like the character detail did. It really made me excited for what is to come for the Playstation 4 in general. The motion capture was perfectly synced with what you were seeing on the screen and you could even notice Troy Baker’s unique facial expressions/quirks on Delsin. It was very cool and only made the experience that much more entertaining. Another thing that we haven’t really seen in old-gen consoles that was extremely obvious in Second Son was the absence of significant visual quality drop between in-game visuals and cutscenes. The transitioning was so smooth, so equal, that I honestly couldn’t see any difference. The cutscenes seemed to just be the camera zooming in on the characters. I saw no difference in the graphics between in-game visuals and cinematics. I usually include “Performance” with the “Graphics” category but in this instance I want to separate them because I don’t want my thoughts on this particular aspect to affect my score on the graphics since the graphics were great. I wanted to give this category a higher score but I didn’t just because I kept telling myself, “this is a next-gen game”. Here’s my issue. The very first thing I noticed when I started playing Second Son was that when Delsin jumped around from one place to another (especially when climbing buildings/walls) he seemed very unnatural. His movements looked unnatural and the control we have over him wasn’t very, what I call, fluid. Here’s an example. When I started to climb up a building, he wouldn’t just climb up, he would mostly jump up. And the weirdest thing to me was when he’d jump to grab onto a ledge, he would jump slightly above the ledge and then drop back down and grab onto it…it’s extremely hard to explain in writing so if you would like to see an example of what I’m saying, please watch my video review. To put it simply, to me, Delsin seemed to float while he would parkour. It felt extremely unnatural to me. Which was a shame because I thought that for a game with this type of increased capabilities, the character movement and control should be enhanced…and if not, it should AT LEAST be more fluid. The Assassins in Assassin’s Creed moved more fluidly and natural in my opinion. Please note though: I am only talking about the parkour, and not any of Delsin’s available power abilities. Those were pretty good. I also encountered quite a few glitches. Nothing HUGE, thankfully, but I did end up going through many walls. And not breaking through them epicly like some superhero making an awesome entrance, no, I mean slipping through a wall where I’d be stuck in a black area where I’d just be floating in a very unflattering position or being bounced from wall to wall like a ping pong because I wasn’t supposed to be in there, type of thing. After a few times of this during crucial moments while trying to get away from enemies… it started to get pretty frustrating. So, Second Son looked like a next-gen game but didn’t fully play like a next-gen game. But hey, this didn’t really affect my liking/disliking of the game it was just something I felt might be important to mention. Just so you know what you might encounter. The gameplay was pretty cool. Although, it was a bit much for me in parts since I have a lot of issues with motion sickness and migraines, but the answer to that was just: play for an hour, then stop and come back later. So, what does “a bit much” even mean? Sucker Punch really shows off their bright and colorful side in Second Son. Some of the powers Delsin has literally glow neon, flash…multiple times in dark areas, and move quickly across the screen. This is bad news for someone with motion sickness and/or migraines. If I played for over an hour without stopping, I would definitely end up with a bad headache. Because of the bright color flashing on the screen that occurs A LOT throughout the game, those of you with epilepsy or a past history of seizures, I’d say MAYBE this is not the game for you…Probably all depends on your situation, but just know, the bright neon flashes happen a lot. As for the motion sickness, I suffer from this and I am EXTREMELY sensitive to the triggers that cause motion sickness. I tried playing InFAMOUS 1 and had to stop 25 minutes in because I was already extremely dizzy and nauseous. So, I kept telling myself…I’m not going to be able to play Second Son. BUT, as I did with Bioshock Infinite, and as I should now ALWAYS do by default, I wore my Seabands (little wrist band thingys that put pressure on a pressure point on your wrist in order to prevent/lessen the effects of motion sickness) and I never once got sick 😀 I’m pretty sure the Seabands did help because with the amount of movement going on on the screen and the bright colors flashing all around, without the Seabands, I would have been vomiting my guts out ¼ into the game. So, I definitely recommend the Seabands to you gamers that suffer from bad motion sickness and vertigo (you can find them pretty much any where in the health/first aid section of department stores. And you can also get them online). Aside from these physical issues that I luckily found solutions to, the gameplay was pretty fun. I mean, you have superhuman powers…you can’t go wrong there! Not only were they fun to use, but also, without revealing anything, I think Sucker Punch did a great job at giving you enough reason/occasion to use each power differently. You had the control of how you wanted to use the powers and on how you wanted to make Delsin approach a fight, which made things that much more enjoyable. Another thing that made the gameplay stand out were the boss fights. Be prepared to GRIND. Second Son definitely took me back to the old days of video games where boss fights were epic, challenging, and brutal. So many times I came very close to breaking my controller, headset, and hand because I was SO fed up with the boss but when I FINALLY beat that boss…I felt so proud of myself. Encounters like that, made many kids back then, the gamers they are now. I hadn’t experienced that type of boss battle in years so as tedious as it was in the moment, looking back, I love that they included the epic boss battle experience. As great as Second Son looks and as fun as the gameplay is, the game is nothing I haven’t seen before. I have played a few games in the past that were similar in style and it is part of an already existing series anyways. Even thought it is its own game and it stands alone in the franchise, it still incorporates the same theme and even art style of the previous games. There are still your typical InFAMOUS comic book style narratives in parts (which I’ve always loved) and it’s not the first time we’ve seen someone with superhuman powers be able to choose whether they’re good or bad. But, the game did have a little bit of ingenuity, which is why I at least gave it a 6. Again, the epic boss battles have been a bit of a rarity in modern day games so that was a nice change out of the ordinary as well as the types of powers and how they are acquired. I thought they were very well thought of, unique, and very cool to manifest. I think this game as enough intrigue to make people go back and play it. I know I am interested in going back to play the game again because you not only have the 2 paths to choose from: Infamous or famous, but you also have a lot of side quests you can do. Even after you beat the game. And Sucker Punch was smart in the way they did it after you beat the game because, again, without spoiling anything, you do have a new way of doing things so it will still feel pretty new, even after you already beat the main story. Second Son was definitely a lot of fun. The powers are what make the game extremely enjoyable and the way you can use them and move around the city is just a lot of fun. Plus, Troy Baker is such a great actor and is so believable as Delsin that just watching his performance was enjoyable to me. Especially when he’s interacting with Travis Willingham (Reggie). You could tell that they have a lot of chemistry (in character & out of character) and it made me really look forward to their scenes together. FINAL THOUGHTS: Overall, InFAMOUS Second Son probably didn’t meet my expectations as a full on next-gen game for the little reasons I mentioned, but, regardless, it was still a very enjoyable game and I’m glad I played it. 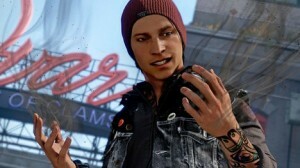 As a PS4 exclusive, it is worth having if you already own a PS4 but if you don’t have a PS4 and you’re wondering if it’s worth getting one to play Second Son, I’d say, if there aren’t other PS4 exclusives you’re looking forward to in the future, I don’t think Infamous Second Son is worth over $400 😉 But, it is a great exclusive to add to your list of future PS4 exclusive must-haves. So, what do you guys think of the introduction of the next-gen games so far? Good? Bad? Do you think it’s only going to get better? Let me know in the comments down below!